During an intense cold snap in Paris, publisher Focus Home Interactive was busy showcasing many of the games in its stable at a self-hosted event, Le What’s Next De Focus. The Council was one of a handful of games that PlayStation LifeStyle was able to sit down and actually go hands-on with while at the event. It’s an interesting adventure game that’ll see an episodic release. 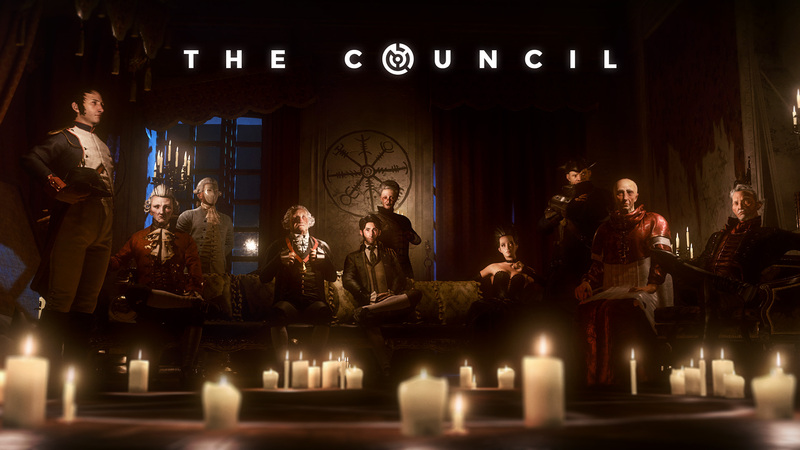 The Council is releasing as an episodic series, with this first episode, The Mad Ones, currently planned for release in March 2018. Episodic releases are a good format for story-driven point-and-click adventure games, if done on a consistent schedule. So hopefully Big Bad Wolf can stick to a regular release stream and players won’t be waiting too long between chapters. The Council puts the player in control of Louis de Richet, a member of a secret society, the details of which were not divulged during this first hour of play. He has been summoned to a mysterious island off the coast of England in the year 1793, belonging to a Lord Mortimer. The cause for Mr. Richet’s invitation? It seems his mother, a woman of prestige and among the highest-ranking members of the secret society, has gone missing while staying on the island. Since the story is taking place in 1793, some historical figures are able to show up and play a part in the narrative. During our hour, we were able to speak with the United States of America’s very first President, George Washington. Other historical figures are hinted at potentially meeting, including Napoleon Bonaparte of France. Hopefully Big Bad Wolf will have some more fun with the era in which The Council takes place, since there is so much history to this period. For those who have played games such as Telltale Games’ The Walking Dead, gameplay is similar in structure but quite different in execution. While basic mechanics are the same, walking around an area in an attempt to find clues that may help progress the story. However, the default skills loadout for Louis makes points of interest show up as little more than small dots of light, which illuminate once a crosshair is placed near them. Possessing the proper skill level when looking around an area will make it easier to spot clues. A lot of games in this genre include quick-time events as a way to inject action sequences into the story, while still giving the player a chance to influence the action. The Council does this by freezing the story for a very brief amount of time, during key moments of a conversation. While the action is paused, the player must highlight a point of interest in the scene, and choose something to focus on. Choosing the right spot may result in an additional clue or new dialog option, while choosing incorrectly appeared to simply not unlock these extra options. For instance, while speaking to George Washington, I was able to notice that he was wearing a lapel bearing insignia indicating that he, too, was a member of the same secret society as Louis. Unlike Louis, however, Washington was much more highly ranked. Confrontation is a common element of conversations in real life. People have disagreements all the time, or don’t want to do something that someone else is requesting. In The Council, confrontations exist as a sort of boss encounter. In this case, Louis has met a high-ranking member of the Vatican, who wishes to deliver an important letter to Louis’ mother. Louis wanted to convince the clergyman to hand over the note to him, instead. The confrontation was presented as a multi-stage conversation. The confrontation would be deemed a failure if Louis chose an incorrect response too many times in the course of the conversation. Furthermore, while each stage of the confrontation was only run through once, the final stage would loop until either the correct choice was made, or the number of mistakes for failure had been reached. It reminded me of Deus Ex’s conversation “bosses,” only perhaps a bit simpler. This mechanic gave the game a sense of urgency that is usually lacking in this slower-moving genre, a welcome change of pace from the norm. Another aspect of The Council is its RPG elements. Louis can rank up several abilities in three separate branches of a skill tree. These can help him deduce facts more easily, or to persuade someone to perform an action for him. Some of these skills also earn him intuition points. These points are used to choose the right action or unlock special dialog options, but they come at a cost and are not infinite. It is possible to replenish spent points, by consuming a special drink. However, consuming too many of these drinks will result in Louis becoming inebriated. This hides the countdown bar which shows how much time is left to make a decision. This was an unexpected effect of refilling points which was amusing to see, and had direct consequences, making future interactions for that chapter a bit more tense. The Council gave off an impression that it was open to trying new things. The confrontations mechanic allows for a boss battle of sorts to exist in a point-and-click adventure game, which is a new idea. An eclectic cast of characters should help to ensure the story stays interesting, and the game’s episodic nature will hopefully mean that fans won’t have to wait long between chapters of the story before seeing its conclusion. The Council: The Mad Ones is currently aiming for release in March 2018, with more episodes to follow thereafter. PlayStation LifeStyle would like to thank Big Bad Wolf and Focus Home Interactive for allowing us to spend an hour playing The Council. Watch this space for more information on this and other games from the Le What’s Next De Focus event, coming soon!